Eli Haradon traveled by stage to Sac City, looking for a suitable place to start a blacksmith shop. Judge D. Carr Early, recommended starting it on the 40 acres he owned, two and one-half miles south of the present site of Early. He even donated ten acres of land for that purpose. The plat was filed for record and recorded January 11, 1878. The new town was given the name of Early, in honor of Judge Early. It was a small beginning, having only six places of business and three or four small houses. All faced east. This is a photograph of "Big Tree Corner," which was a widely known landmark. It was at the junction of U.S. Highway 20 and 71, about two and one-half miles south of the present Early. The original town of Early stood just outside of this picture on the right. This snapshot was made in the early 1920s and the tree remained standing for at least 50 more years. Some time prior to 1882, surveyors came to survey for the NorthWestern Railway. 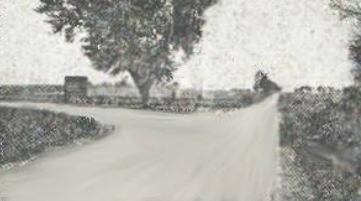 But the farmers protested so badly against having their farms cut up by the railroad, the project was given up in this area and the rails were laid from east to west, two and one-half miles north of Old Early, in the year 1882. Knowing there would never be a thrifty town off the railroad, the few citizens of Old Early decided to move the town the two and one-half miles north and have the benefit of the railroad. Some of the buildings were moved to the new town site, and others to various locations. Old Early was vacated September 19, 1882. Orlin Haradon bought the 40 acres where Old Early once stood. Eli Haradon Blacksmith and Wagon Shop was started in old Early and later moved to New Early in 1882, where about a year later it was destroyed by fire. 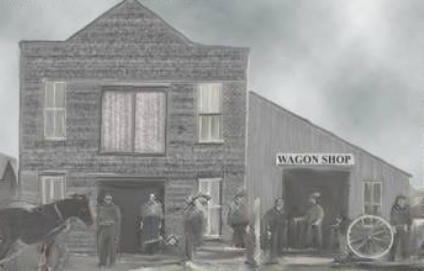 The new town of Early started with several houses, a post office, railroad depot, the Haradon Blacksmith and Wagon Shop, a meat market, barbershop, a two-story wooden school building, and an "exchange" type bank located in the general merchandise store. Telephone service was introduced in 1914 by the J.M. Kelly Co. and the Farmers Telephone Co. These two companies united under the name of Early Telephone Co. and functioned until 1929, when it was sold to the Central West Public Service Co. The water works were operational in 1895. 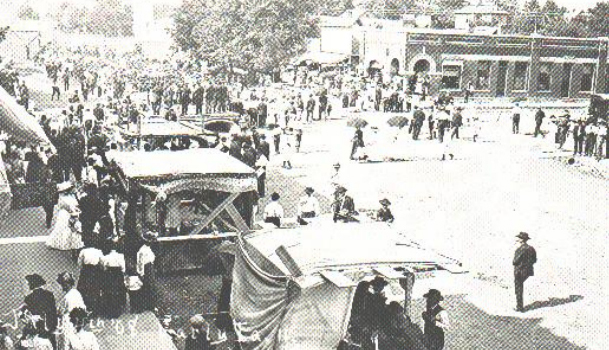 The Early News of July 1, 1898, stated that, "The public watering trough at the corner of First and Main Streets has been set, the main tapped, the water turned on, and all that people coming to Early have to do to water their teams is to drive up to the trough, uncheck their horses and let them drink." The citizens of Early were displeased with the former gas plant and its poor lighting system, so in the autumn of 1913, the first electric light plant was built. Cement sidewalks were put in front of the post office, meat market, Allen's Hardware Store, Pioneer Drug Store aned Hartman's Restaurant on the west side of main street in 1897, taking the place of the plank walks laid previously. This view looks south on Main Street, taken from the roof of the bank. It shows the effect of a devastating fire sometime before 1897. July 4th was a time for celebration. This would be equivalent to the current Crossroads Day celebration. The first attempt at banking was styled as the "exchange", a sort of banking business transacted in a general merchandise store, but it did little real banking business. The first bank proper was the Early State Bank, organized about 1888. It was conducted in the building which was later to become the Masonic Lodge Hall. It was established as a private concern, but was soon converted into a state bank, and finally merged into the State Bank of Early. State Bank of Early, successor to the Early State Bank, erected this fine brick building about 1900. The Citizens State Bank of Early was organized January 1, 1911, with capital of $30,000. In 1925, a merger was affected involving the State Bank of Early and the Citizens State Bank. The reorganized institution operated until January 1927 as the State Bank of Early. The Early Savings Bank had its beginning at the meeting of depositors of the closed State Bank of Early on January 29, 1927. This was the Engler Antique Shop building on the east side of Main street, between Carla's Mane Creations and the Municipal Building. It was vacant when this photo was taken April 1, 1984. It has since been torn down. 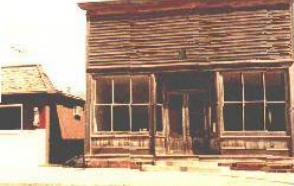 Note from Jaime Beers Shaffer, granddaughter of Cecil and Etoile Engler, tells that the photo is of her grandparent's building shortly before it was torn down. It was the Engler Antique Shop for 20+ years prior to it's demolition. She grew up in that building and helped with the shop for many years. She distinctly remembers being there as hundreds and hundreds of people toured through the antique shop during the Early Centennial in 1982. Her grandmother sold the building shortly after the centennial. Her grandfather Cecil Engler, grew up in Early so he knew a lot of the history of the building from his childhood (early 1900s). To her knowledge, the building was a bootery for some time and it had a large metal boot hanging over the door. In the late 1930s it was the Rush and Mary Drury restaurant building and was known as the "Rush Inn." This is a picture of the old Early depot. It was on the west side of main street. The lumber building to the right was replaced with Payless Cashway's new block building which was torn down in 2014.